Home / Download Center / Electrical Engineering Books and Technical Guides / Electrical engineering guides / Electrical Safety Practice – Lockout Before Work, Test Before Touch! Switching is the manual operation (opening or closing) of any electrical isolation on energized equipment. Manual operation includes the operation of through-the-door breaker handles or other dead-front switching. 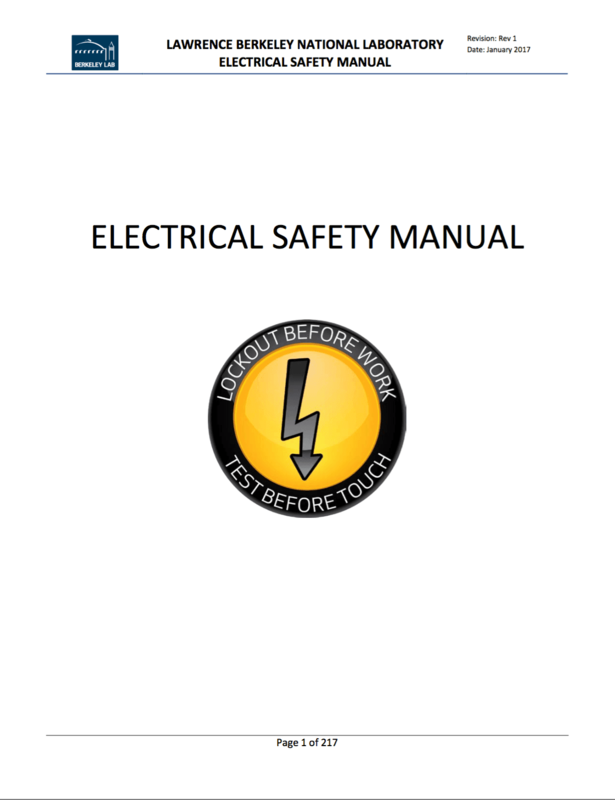 Electrical Safety Manual – Lockout Before Work, Test Before Touch! All non-qualified electrical workers who perform switching on premises wiring panelboards or any circuit breaker or fused disconnect rated at 15 Amps or greater must take the class Electrical Switching Safety for non-qualified electrical workers. This section concerns the switching of electrical disconnects and circuit breakers for normal operation of electrical equipment. 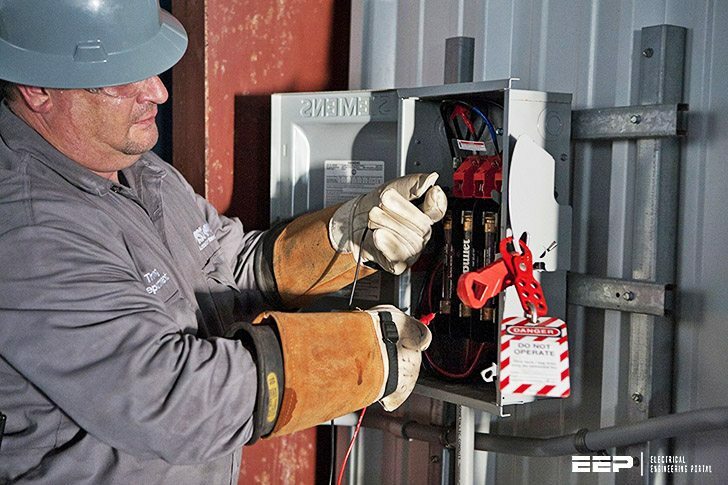 Non-qualified electrical workers are permitted to perform switching on panelboards and local equipment disconnect switches (fused disconnects or circuit breakers) where there is no shock or arc flash hazard. Check the condition of the panel enclosure. Switching is allowed where the panel is fully enclosed and in good repair. There can be no visible exposed live parts. Covers must be latched tight and all fasteners must be in place. Finger safe rating is not sufficient for switching of disconnects inside enclosures by non-QEWs. An arc flash hazard is a dangerous condition associated with the possible release of energy caused by an electric arc, resulting in second-degree burns to the skin or ignition of clothing. An arc flash hazard may exist when performing normal switching of electrical equipment. Where a panelboard or disconnect switch is labeled with an arc flash label, check the incident energy at the working distance. Switching is allowed where the incident energy is 4 cal/cm2 or less. Where the panelboard or disconnect switch is not labeled with an arc flash label, contact the Facilities Engineering Department for assistance getting an arc flash label. If switching is required before the label is available, check the panel voltage and main circuit breaker or fuse amp ratings. In all other cases, a Qualified Electrical Worker is required to perform the switching. The minimum PPE for electrical switching is a leather glove on the switching hand and safety glasses. Stand to the side. Where possible, do not reach across the panel to the switch handle, instead stand on the same side of the panel as the switch handle. Place hand on the switch handle but do not operate the switch. Face away from the switch, close the eyes, take a deep breath and hold it. Forcefully throw the switch in a complete full motion. Circuit breakers are designed to trip for two types of overcurrent condition: overload and short-circuit. In an overload condition, the thermal element will open the breaker after a certain time depending on the amount of overload. This can take anywhere from an hour (135% overload) to a couple of minutes (200% overload). This action protects the wiring insulation from overheating and causing a fire. This can happen when multiple high current loads are run at the same time on the same circuit. For example, running a space heater, a coffee maker, and a microwave at the same time. In a short-circuit condition, the breaker is subjected to a high current surge (>2000 Amps) and uses the resulting magnetic impulse to trip the breaker instantaneously. This can happen either by a ground fault (for grounded equipment) or a phase to neutral short. It is important to note that while breakers are rated to interrupt a short circuit once without failing, it is possible (even likely) that they will fail catastrophically should they be reclosed on short circuit. This can result in injury to the hands and face. If it is readily apparent that the circuit breaker tripped on an overload condition, correct the condition by removing the excess load. After removing the excess load, reset and close the breaker. If the circuit breaker trips again, leave it alone and call a Qualified Electrical Worker for assistance.